The African proverb, "it takes a village to raise a child" is exemplified by African American Grandparents when their own adult children are unable to take care of their children due to addiction, incarceration (often related to addiction) or mental illness. Studies indicated that when raised by grandparents, grandchildren often report feeling loved. 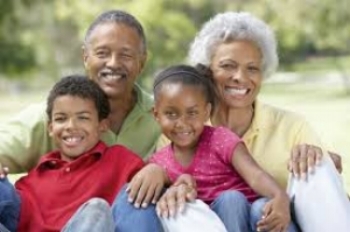 In addition, African American Grandparents often introduce their grandchildren to family rituals (family dinners), cultural rituals, history, constant and predictable routines, the adult protective shield, spirituality and God. All of these have proven to be substance abuse prevention protective factors. Grandparents raising their grandchildren often lose their own personal freedom and the opportunity to enjoy the golden years. Many are economically poor and raise grandchildren who have often experienced neglect, abandonment and maltreatment due to parental addiction, mental illness, incarceration or a combination. This can be quite stressful. Some grandparents are raising their adult children and grandchildren simultaneously. We owe black grandparents! I owe black grandparents. My grandparents became my caretaker the year addiction and incarceration impacted both sides of my family. I was bitter because I was not living with my parents and took my bitterness out on my grandparents (youth often demonstrated their frustration where they feel safest and most loved). This was my junior year of high school. The angrier I acted, the more loving my grandmother became. She was a saint, a praying grandmother! That year I failed 2 classes and my 2.0 grade point average dropped to 1.5. I demanded, in a harsh tone, that my grandfather give me money to pay for summer school. He said to me, "I'm not giving you anything! If you want to destroy your life, I'm not going to pay for it!" My grandmother overheard the conversation and with tears in her eyes said, "Give him the money. I love him" I understand the research that says that children raised by their grandparents often report feeling loved. That event was the catalyst which propelled my life forward. I try to honor my grandmother by being successful as I can be. Each time I go to the barbershop I give the barber an extra $15 to anonymously pay for the haircuts of grandsons raised by grandmothers. What are some little things you can do to support grandparents raising their grandchildren?